Any patient can now be kept under full surveillance. Today’s technology lets you send an email or adjust a thermostat from anywhere in the world. Vital signs monitoring should work the same way. 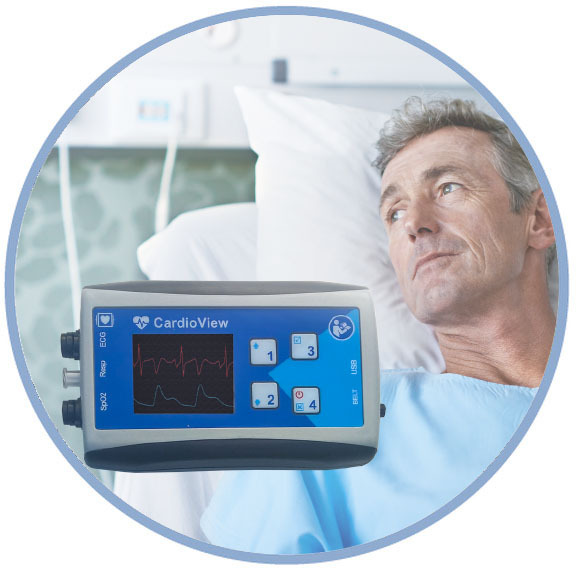 With the CardioView Telemonitoring system, patients can undergo highly accurate, continuous vital signs monitoring while avoiding the expense and hassle of staying in a medical facility. Our system is designed to continuously measure and transmit electrocardiogram (ECG) and vital signs data from the patient to a medical practitioner or facility, regardless of geography. Because data transmission is almost instantaneous, our system allows early detection of abnormal vital signs. Medical professionals get alerts on their mobile devices if anything goes wrong, reducing the risk for adverse events throughout the entire hospital stay and after. Our technology’s built-in data communication creates better outcomes for your patients, both in the hospital and after they’re discharged. Patients get the benefits of having a doctor or nurse on-site at all times, at a fraction of the expense. When it comes to remote vital signs monitoring, a reliable signal can be a literal life-or-death matter. Our devices are designed to ensure continuous service no matter where you are or what other technology you’re using. CardioView devices transmit data over Wi-Fi or 3G to the CardioView server. From there, it can be accessed by the CardioView Telemonitoring Software and Smartphone Apps for near-real time monitoring. A convenient vital signs monitoring system isn’t convenient if it’s not compatible with your current Wi-Fi or 3G network. CardioView works for you no matter what network you and your patients are on. The server can be located in a hosted data center (cloud) or within the hospital network (local). The CardioView Telemonitoring Software and Smartphone apps do not have to be in the same network as the CardioView devices. That means monitoring can take place anywhere and anytime. Logistical problems can stand in the way of perfect vital signs monitoring. Doctors and nurses have heavy caseloads, they’re working busy shifts, and they can’t be everywhere at once. That makes it easy to miss a warning sign. CardioView is designed to overcome these hurdles. Our monitoring devices come with software that can be installed on multiple computers for monitoring at different locations, inside and outside the hospital—so it’s available to any member of the team who needs to see it. All installations monitor the same patients through the server. The software features patient data management, near-real time monitoring, alert detection and display, so you’ll know immediately if something is wrong. It’s easy to report all recorded data. And our system interfaces with electronic medical records, so you can quickly check up on a patient’s history or add data to their file. Providing medical treatment requires talent and training, but using vital signs monitoring software doesn’t have to. Our telemonitoring app is as easy and intuitive to use as your email or texting app, so there’s no learning curve—viewing patient data is convenient even on day one. Staff can use our apps to access near-real time ECG and physiological data, and view alerts and push messages for their patients. Our telemonitoring app is available for Android and iOS, and you can download it free from the app store. Telemonitoring of every life, every moment, every day. All company names, product names logos included here may be registered trademarks or service marks of their respective owners. Copyright 1988-2018 Medeia. All Rights Reserved.